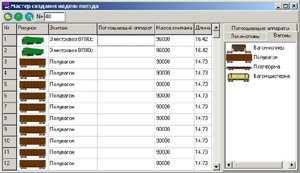 The module for simulation of train dynamics (UM Train) is developed in the program package "Universal mechanism". This module automates the process of train model creation and the analysis of obtained results. The module allows computing the longitudinal dynamics of train in braking, traction and idling modes on a railway track of any configuration. Not only common variables for a mechanical system such as coordinates, velocities, accelerations, reaction forces etc but variables which are specific for a train (for example forces in intercar coupling and braking forces) are available for a user. UM Train3D module is a superstructure over the UM Loco and UM Train modules. It allows the user to create tractive connections, as well as inserting in a train any number of 3D models of rail vehicles. In particular, a train model can include a tractive connection of several cars and/or locomotives or it can be completely combined of 3D vehicle models. Our experience shows that connections of 3-5 3D models of vehicles are often used for advanced analysis of rail vehicle dynamics taking into account in-train forces at various train operation modes. 3D models of cars and locomotives must satisfy a number of requirements to be included in a train. For instance, models should include mechanical coupling systems (automatic couplers, buffers). Besides, braking mode must be provided for 3D vehicles, and traction modes for 3D models of locomotives. When creating the model it is necessary to take into account many factors such as gas-dynamic processes in an air brake system, forces which resist moving the train forward (resistance forces), various types of intercar couplings, complex track profile etc. By using the UM Train module the process of train model creation became simpler. The user points a number of railway vehicles, their types, as well as types of center coupler draft gears which are used on the corresponding vehicle. The type of a vehicle is selected from the data base of locomotives and cars. This base is open for adding a model of any vehicle. For that in the simplest way it is enough to create the graphical image of a vehicle, to set the coupled length, the mass, the resistance forces, the traction performance for a locomotive and in case of need the forces which are specific for the described vehicle. Every vehicle of the train in terms of Universal Mechanism is a subsystem which can be a model of any complexity. Though in most cases it is enough to create a single-mass model of a vehicle, more precise vehicle model can be included in the train model to make more detailed analysis of a separate vehicle in the train. Various mathematical models of brake systems, resistance forces, intercar couplings are contained in the module data base. In case of need models with any other characteristics described by tools of Universal Mechanism can be added to the base. It is often necessary to analyze the train dynamics on a way with complex geometry. A special tool is developed for creation of complex railway track profile. Since the train module is a part of the program Universal Mechanism, all tools for analysis of simulation results are available. Any kinematic and force parameters can be represented in graphical and table form. All methods of multi-parametrical and multi-criteria optimization, scanning and approximation can be used for solving problems of train dynamics.